Congrats to Alice who is the winner of two Earthenwood pendants. Please email Melanie with your mailing address so she can send your new pendants out to you! This week we have guest blogger Lori Anderson bringing us a fun book review. I was thrilled when Potter Craft sent me a copy of Sherri Haab's latest book, "The Art of Resin Clay". I'd never heard of these techniques before and was immediately intrigued. * Imitative Techniques, which covers faux scrimshaw, raku, coral, and metallic effects. * Mixing Resin Clay with Other Mediums, such as embedding beads, using colored pencils, etc. *Molding and Sculpting Techinques, such as repairing and redesigning vintage jewelry and creating beads over cores. All of Sherri's books are eye candy. If you never make a single project, you'll still get inspired just by flipping through the book. But you'll want to try these projects out, because she breaks things down in such a way that ANYONE can do it. And now, I'm giving it to one of you! So the question this week - what has been your favorite bead book of 2011? Leave a comment and be sure there's a way to contact you. Then visit my blog, Pretty Things, and learn about the upcoming Bead Soup Blog Party! It's one of the largest bead swap blog hops you'll come across, and wouldn't it be cool to use your new resin clay techniques for the Party? I just started making jewelry and I work for a used book store, so I've been picking up older bead books and magazines lately. I seem to be learning a lot from them all, so it's hard to say I have a favorite. This resin clay technique looks very interesting! Although it's not exactly a bead book, it certainly is intertwined with the bead world. My favorite book of the year was "The Jewelry Architect" It was filled with ideas and techniques I have honestly never seen and the cover itself caught my eye like no other before it! I had a few other faves too like Heather Power and Barbara Lewis' books, both fantastic reads! My favorite book this year is a french book Bijoux en pâte polymère explorations créatives. For those who like to make beads in polymer clay. Lots of techniques that get you further . Europeans are doing design in a different way than Americans and for me that is a plus. tough one--I'd probably go with 30 minute necklaces, (this may have been 2010, not 2011) because it was really different than the typical designs I'm used to seeing in magazines and books. Oh, wow! I've had my eye on this for months on Amazon and now it's been reviewed by someone I consider a trusted resource. How great is that? I'm also hoping to be one of the random chosen for the Bead Soup party (fingers crossed!). You do a great job, Lori. I have to say my favorite book this year was Barbara Lewis' book Torch Fired Enamel Jewelry. So much eye candy and all the projects are easy to follow. I have been through her book a lot, just to see the gorgeous pieces! The Beader's Color Mixing Directory by Sandra Wallace. When I was a quilter, I loved to work with the color wheel and this helps incorporate that into my jewelry making! I'm so excited to learn I won Earthenwood pendants! Thank you so much! As for the book, this is the first time I've seen it. The technique sounds like a lot of fun! Another book to add to my ever-growing list. I have so many books, and it's difficutl to choose a favorite. I really like Barbara's book 'Torch-Fired Enamel Jewelry', but have not actually made anything from the book...yet. I'm loving Easy and Elegant beaded Copper jewelry because it has instructions for so many links and clasps in one book. my favorite bead book of 2011 was heather powers' inspired by nature. a super-brilliant, soulful book. close second? barbara lewis' painting with fire. such a fab, innovative technique. I'd have to say Julie Picarello's book Patterns in Polymer has been my favorite for 2011. My favorite book this year is "Handcrafted Wire Findings" by Denise Peck and Jane Dickerson. I just love making my own findings for all my beaded jewelry. Many to choose from, but my favourite bead book of the year was Jamie Cloud Eakin's "Dimensional Bead Embroidery"...a solid follow-up to "Beading with Cabochons". Resin clay is one of the things I'm planning to try in 2012. Have got a couple of resin clay books on my wishlist, but this one I've missed. Looks interesting! As for favourite book of the year, I actually haven't bought or read that many last year. It's mostly been magazines and books on other crafts. One book I did buy and enjoyed, though, was Jane Davis' Bead Embroidery: The Complete Guide. with the subtitle "bring new dimension to classic needlework". It's not bead embroidery as in the kind used in jewellery where you just see beads and no thread, but rather about adding (seed) beads to embroidery stitches, ranging from canvas embroidery to ribbonwork, from darning to crazy quilting. Very inspirational as 2011 was the year I "rediscovered" needlework. This book looks interesting, although I doubt I would make anything from it - not sure though. My favorite book of 2011 related to beading is steel Wire Jewelry by Benda Schweder. I am really enjoying working with wire - and this book puts steel into an VERY new light! It's really hard to pick a favorite book for 2011, but I'd have to say mine is Julie Picarello's "Patterns in Polymer." So many to choose from this year (most of which I bought!) I think my favourite is Metal Style, by Karen Dougherty. Have been working with the Apoxie Sculpt clay for a few months, this book looks fantastic! Now that is a toughy but I would have to say HANDCRAFTED WIRE FINDINGS is the I seem to be reaching for the most. This book looks terrific, but my favorite beading book this year is Barbara Lewis' book on torch fired enamel. Love her style and generosity in sharing techniques. I had a few this year including some wire books but in the realm of seed beads it would have to be Jamie Cloud Eakins Dimensional Beadwork and in second place Artistic Seed Bead Jewelry by Maggie Roschyk, (just love stone and seed beads together). Happy New Year too ABS! My favorite book is a type of beading book, it is The Color Inspirations, polymer clay color book. It teaches how to make beads but so much more. It teaches to get to know the colors and how they behave within the different brands and such. Just love it, It's by Maggie Maggio and Lyndley Haunani. My favorite book from 2011 would have to be Painting With Fire. It's a wonderful book. I haven't worked with resin clay before it looks interesting. I enjoyed reading Ceramic Jewelry by Joy Bosworth. This is not a project book but provides a good overview of the field. My favorite is Jamie Cloud Eakin's Dimensional Bead Embroidery. It is a feast for the eyes, and is a great instructional book for bead embroidery. I would enjoy adding resin clay to my repertoire in 2012. Thanks for the opportunity! I think I have just added a new book to my must have list! I think my favorite was Kerry Bogert's Totally Twisted book. I really enjoyed her use of color and made some really cool pieces of jewelry. without a doubt....Painting with Fire by Barbara Lewis. Not totally beading, but I just got a copy of "The new encyclopedia of jewelry making techniques." I cannot put it down! Would have to say currently my favorite book is 101 wire earrings. I have gotten into bead embroidery this year and love Dimensional Bead Embroidery by Jamie Cloud Eakin. Wonderful techniques, simple directions and lots of yummy photos. In fact, I bought two more copies for Christmas gifts for fellow beaders. Has to be Sherry Serafini's Sensational Bead Embroidery! I do a lot of bead embroidery and her use of texture and color are inspirational- impossible to copy but full of possibility! My favorite book this year I didn't understand a word of. I made a friend whose mom actually wrote a Japanese beading book. Since I can't read Japanese I just enjoyed the images. Knowing the beautiful spirit that is her daughter and then meeting the author was one of the highlights of the last year for me. The fact that I taught her daughter something and her mom complimented my work was just icing on the cake. My favourite book of 2011 has been Handcrafted Wire Findings by Denise Peck and Jane Dickerson. I would have to say my favorite creative book of the moment would have to be Painting with Fire .....Barbara Lewis's Book on torch enameling, it is the last "real" book I have bought.... I am lucky enough to have both a nook, and a kindle Fire, my christmas present from my hubby, so now all my fiction is in ereader form.....I did get an incredible gorgeous art book, Alphonse Mucha Master Works, from my daughter for christmas, and I am totally in love with it! This books looks fascinating! I can't wait to check out this fabulous medium! I can't wait to check out this fabulous medium! Great stuff to be found here! I have to say that my favorite book of 2011 was Patterns in Polymer: Imprint and Accent Bead Techniques by Julie Picarello. What eye candy, and fabulous techniques! I forgot to leave my email yesterday with my picks Jamie Cloud Eakin's Dimensional Bead Embroidery and Maggie Roschyck's Artistic Seed Bead Jewelry My email is mouski7@ymail.com just in case you pick me. Have to agree with Linda K. Julie Picarello's "Patterns in Polymer." Although I haen't tried any of her techniques yet I love looking through it. Her colour combos are beautiful. I think Jamie Cloud Eakin's Dimensional Bead Embroidery is beautifully done and quite inspirational! I have to say I havent bought a bead book this year....altho I love to pore over several bead magazines that I subscribe to. Would luv to tackle another medium and this book really looks interesting!!!!! My favourite book for 2011 has to be Mastering Beadwork by Carol Huber Cypher. I love working with seed beads and own a myriad of booking beads but this is one of the best. A book with clear and concise instructions, it also encourages the beader to experiment. A great book for beginners and more experienced beaders. There are too many to name...but technique wise...my favorite is Dimensional Beadworkd by Jamie Cloud Eakin. Lots of great tips in this one. But also love Patterns in Polymer from Julie Picarello--it's not mine but my mom's. I love looking through it with all the color and shapes. I love the Belle Amoire books (magazines?) because they cover so many different areas of jewelry making. Also, Barbara Lewis' torch fire enameling book - I'm in the process of getting a torch-fire area set up. Resin Clay sounds interesting & would love to try! I am loving "Handcrafted wire findings". This book has been a constant resource of inspiration for me. I love having a book devoted strictly to creating findings. Love the possibilities with Sherry's new book! My go-to book from 2011 was Jamie Cloud Eakin's "Dimensional Bead Embroidery." Fabulous! Even after doing bead embroidery for 20 years, I learned new techniques and tips. It is impossible foe me to pick one!!! So, I am breaking the rules and stating: Handcrafted Wire Findings by Denise Peck and Jane Dickerson, Wire Style 2 also by Denise Peck, and Totally Twisted by Kerry Bogert. I have truly referred to all 3 of these books constantly and equally! For me, Barbara Lewis's Torch Fired Enamel Jewelry. Having met her and seen her work it inspired me to get my own torch and play! It is very clear and easy to follow, great reference! I think this book will be my fave for 2012! For 2011 I spent most of my time browsing internet articles and how-tos. Lots of great books mentioned here, but I must jump on the bandwagon - Painting with Fire by Barbara Lewis is the best book for me this year. I actually bought her kit and made a fist full of enameled beads in a couple hours!! It's a rare book that can actually motivate me to actually try something new. I love jewelry making books, love looking at all the creativity, and this book your giving away looks very good. Thanks for the chance to win it! Love books about any and all jewelry techniques. Barbara Lewis' is an all time fav. My favorite book this last year was Painting With Fire. Great projects, easy to follow directions. Of course Sherri's books are wonderful so this may be my favorite this year! Well, I haven't purchased Barbara Lewis' Painting with Fire yet, so I can't choose it. I think my favorite for this year is Diane Fitzgeralds Shaped Beadwork. I've made several pieces from it, and it continues to excite me. The resin clay book looks fascinating, and I love learning new things, so thank you for the giveaway! Thank you for the review. My favorite book is also the Barbara Lewis torch enamel book. I wish I had the nerve to try some of the projects. I am a little too afraid of the torch. This book sounds like an amazing read. I have not bought any beading books lately as I have been trying to use up what I have and there is so much inspiration available online. Hi! My favorite book is 'Metal Clay The Complete Guide' by Jackie Truty. Amazing book! and this giveaway is my chance to learn more clay technique. Thank you for make it, Lori!!!! Without a doubt, Cynthia Thorntons Enchanted Adornments !!!! A romance novel and jewelry making techniques all in one. SHEER GENIUS!!! I also love Painting with Fire by Barbara Lewis and since I actually followed the instructions and tried torch fired enamel for the first time successfully, it is my favorite book of 2011! The book you reviewed sounds very interesting as well...I would love to win it!! The book be given away looks great! 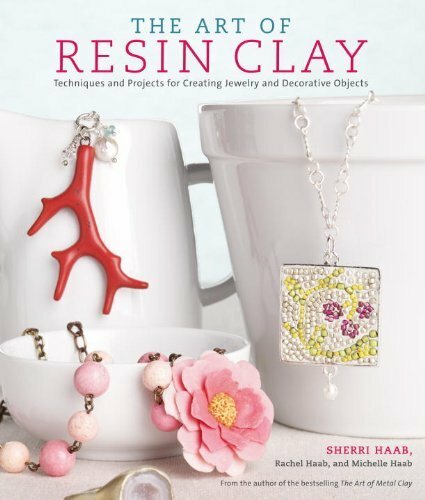 Would love to win this book and give resin clay a try. I have several beading books but my favorites are the Stampington Magazines especially Belle Armoire Jewelry! Being a sporadic jewelry making person, I have loved reading and making "Stamped Metal Jewelry by Lisa Niven Kelly. I like to combine pictures, vintage beads and stamped metal message jewelry. Kaari Meng's French Inspired Jewelry is anothe new favorite read. My fav this year is Painting with Fire. BUT this would be my fav for 2012! I am planning on digging into resin creations this year, and resin clay sounds amazing. Imagine all the possibilities it opens up. Pick me! Pick me! Painting with Fire is my pick for 2011. Great stuff! This book looks incredibly interesting too. Adding it to my wishlist right this minute. My queston would have to be what is my favorite book for what medium. I have favorites for several mediums I work in Metal, wire polymer clay seed beads and stringing. I am in love with Julie Picarello's polymer clay book and the make your own wire findings book. Sorry I do not have them in front of me for the correct title. I have loved the Heather Powers book so much and a book I got on cold connections that I can't remember the author right off hand but it has a cool metal owl piece on the front cover. This one looks like it would be awesome to have to add to my collection!! I just purchased "Easy & Elegant Beaded Copper Jewelry". Wow! It has so many things for me to learn, not the least of which is the large variety of links. I can see this will be a well-worn book. Hi Lori! I must say I thoroughly enjoy reading your blog posts. I do hope you keep writing, you are such an inspiration! And also, your jewelry is beautiful! As for my favorite beady book (so far)has got to be "Torch-fired Enamel Jewelry" by Barbara Lewis. I just received it and cannot wait to get the supplies to get started. But who knows, maybe "The Art of Resin Clay" may be my new favorite (grins). Thank you for the opportunity and thank you for being you, keep up the good work! I haven't done any resin but the resin clay looks great! I would love to give it a try! My favorite book last year was Barbara Lewis' Torch Fired Enamel Jewelry - Painting with Fire.